Ive always felt the rhythmic sewing machine sound , of the of a well adjusted solid lifter cam engine, and a rumbling gurgle in the exhaust note , with the instant explosive rpm acceleration and three stage progressive stepped, moan as the secondaries on a set of correctly adjusted dual quads, was and is what a properly built performance street/strip engine SHOULD sound like , tromp on a high compression ratio 454- 496-540 cubic inch big block thats properly built with the correct matched components, like a couple 600 cfm holleys on a dual quad intake and watch the many yards of dark black tire marks rapidly recede in the rear view mirror clouded with tire smoke. TUNNEL RAM intakes are a different deal, now thats not saying you can,t make excellent power with dual quads, but they are not the only way to get there with today's technology and they take some experience to tune correctly, experience few guys have or understand, so you will frequently see test results showing that dual quads make less power than a properly tuned single 4 barrel car intake. keep in mind when your using DUAL carbs with 8 venturies they effectively reduce the engine created vacuum under each carb significantly , compared to the same size single carb on the same engine, so a carb rated at 500cfm as a single carb probably flows less than 350cfm as a twin carb, if your new to dual quad set-ups your going to be thinking 2 500cfm carbs equals 1000cfm, in reality your looking at about 700cfm-750cfm , and two 600cfm carbs flow about 800-850cfm due to the reduced vacuum signal under each carb. Ive used both sizes and got good results from both. the 500cfm might be easier to tune for most applications but either will work. 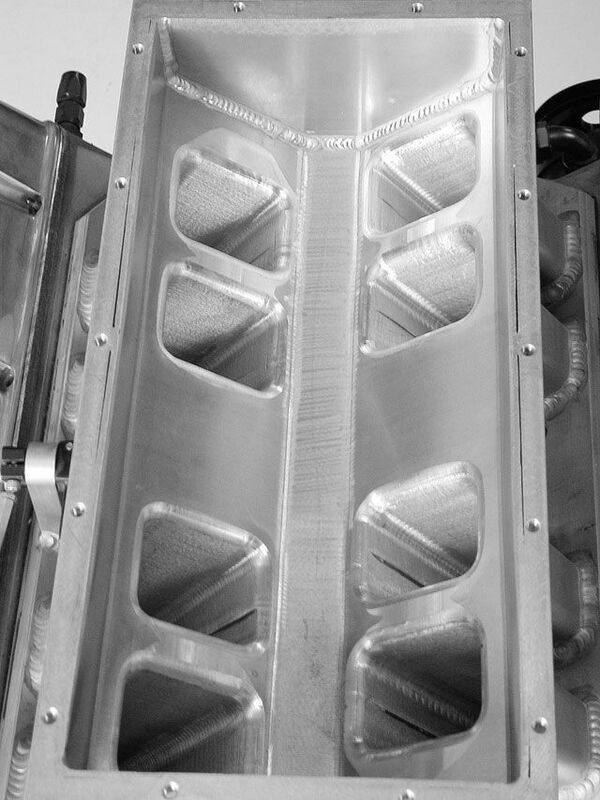 4 barrel carbs are rated at 1.5" of vacuum doubling the available number of venturies from 4 too-eight effectively reduces the vacuum by at least 40% thus each carb will flow less air thru each venturie, while a single 500 cfm rated carb flows 500 cfm at 1.5 inches of vacum its only flowing 365 cfm at a bit less than half the draw like it would see in a dual quad setup at W.O.T. 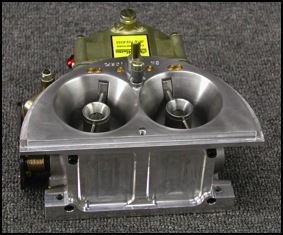 if its higher than about 2 inches of vacuum you might benefit from a slightly larger carb. 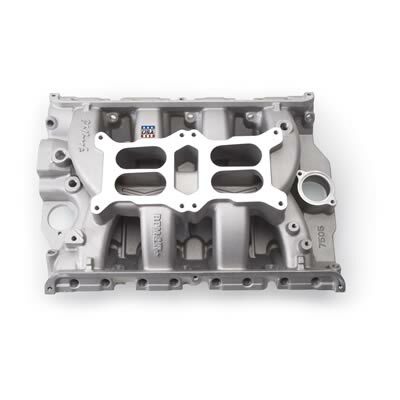 4v carbs are rated at a flow rate determined with a vacuum or pressure drop of 1.5" of mercury, your best power AT WIDE OPEN THROTTLE AT MAX RPMS will generally be found with a carb that lowers the pressure drop or vacuum to between 0.5" and 1.0" of vacuum, not 1.5" at full throttle,more vacuum at full throttle indicates a slight restriction to flow, now on a street car that's not going to be much if any problem, but on a race cars engine its a sign that your potentially giving away some potential power.you might want to keep in mind that carbs are flow rated at 1.5 inches of mercury, heads at 28" of water and that anyone who has ever watched a vacuum gauge, will tell you the readings fluctuate rapidly, under most conditions and vacuum tends to vary with the cam,used the rpms the engines running, displacement and intake design,exhaust scavenging,ETC. in most cases there factors are at least, mostly or on occasion, partly understood well enough that theres formulas and charts that can be used to define probable results, that parts selection will result in to a reasonable degree. lets look at your common 600cfm carb some of you guys use, a 0.5 inches of vacuum it flows only about 350cfm, at 1.0" it flows about 500cfm, at 1.5" it flows about 600 cfm , rated like a two barrel at 3.0" of vacuum it flows close to 780cfm, and if you stuck it on a 600 cubic inch big block spinning 6000rpm you'll pull about 6" of vacuum and it would flow about 1000cfm plus! now remember you'll try to stay in the .5" to 1.5" range at full throttle, to make good power. now some of you might notice that the flow dropped NOTICEABLY once the vacuum dropped and dropping the vacuum at wide open throttle tends to help power, provided the a/f ratio is kept near 12.5-13.0:1, AND the engine is set up to USE the flow available to it. your engines torque curve on an rpm scale closely mirrors the engines efficiency at filling the cylinders, on that same scale, once the cam timing and port flow become a restriction power falls off because theres less fuel /air mix burnt per power stroke, the power tends to keep going up for a little further in the rpm band simply because theres MORE ,thou slightly less effective power strokes per minute. some of you may have figured out that to get the lower vacuum or restriction, you'll want a larger carb or perhaps two carbs, remember were trying to get that .5"-1.0" of vacuum at full throttle, and that 600cfm carb is not going to flow 600cfm, at that vacuum reading but between about 350-500cfm, so if you have an engine that can take full advantage of the flow it may, and usually does require a larger carb to make max power,that 383 might require an 800-850cfm carb or two 600 cfm carbs (since you double the venturie cross sectional area with two carbs the vacuum reading is generally cut to about 1/2 what it was and the two 600 cfm carbs now flow about 350cfm each or 700cfm per pair) yet the carb size is just NOT all that critical, to making fairly decent (NOT MAXIMUM POWER) simply because as the vacuum signal goes up, so does the carbs flow rate, and as the vacuum signal strength goes down so does the flow and to some extent the RESPONSE! up till now we are talking only FULL THROTTLE POWER, but on the street,you operate under a wide range of rpms and loads, put that larger carb on a small engine and it makes good power at wide open throttle, but it also tends to have a weak vacuum signal at off idle rpm ranges and it may run like crap! so a balance must be accepted. smaller carbs are generally more responsive, in a street combo,but slightly more restrictive with their smaller venturies. this allows the DUAL QUAD SET UP TO HAVE SOME ADVANTAGES, remember your dealing with 8 small venturies, set up in distinct pairs, that can be set up to come in in series, or progressively not only 4 larger venturies on a single larger carb., and you can adjust most dual quads to come in in four distinctive stages, rather than just two larger ones, in most cases I set up STREET DUAL QUAD SET-UPS, so the rear carb primaries open about 1/4 of the way before the front carb primaries start to open and then the rear carbs secondaries start to open as the primaries on the front carb open about 1/4 of the way, then the front carbs secondaries open last, this is done with a progressive sliding linkage and changing the radias distance, on the carbs throttle linkage. ok, I don,t agree, IVE almost always found that properly tuned dual quads, produce excellent driving and performance characteristics. 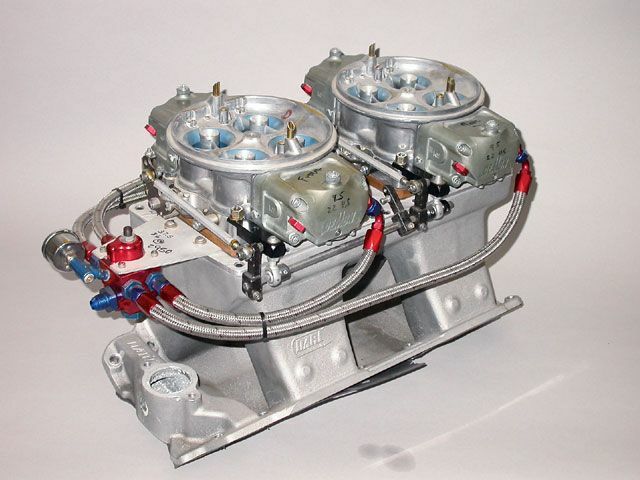 in fact two well tuned 450-650 carb can and frequently do allow for a better hp curve than either a single dual plane or a single carb single plane, now you might give up a bit of peak hp to the single plane but you'll generally have more peak hp than a single carb dual plane and a bit more mid rpm tq than either of the other two set-ups. naturally having them set up and tuned correctly is mandatory. BTW what most guys forget is a 600 cfm rated carb is rated at set vacuum reading, double the venturies area with twin carbs and you've just significantly reduce the vacuum under each venturie reducing the flow rate considerably. the runner design and plenum design naturally effect results. PROPERLY SET UP DUAL QUADS can be a killer set up, the problem is that so few people understand the tuning issues and get them correctly adjusted. 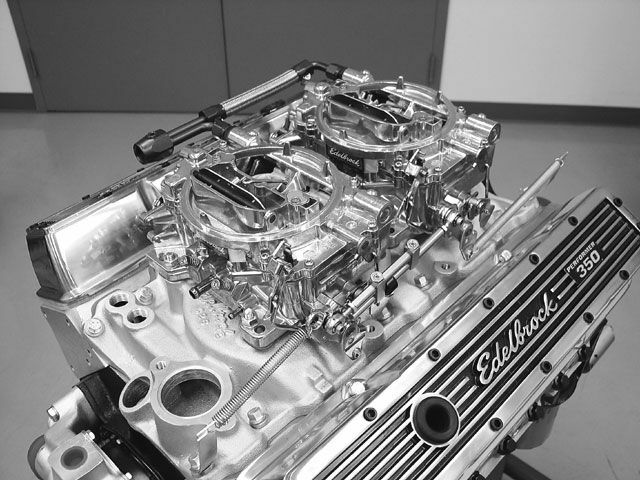 your correct the edelbrock low rise is a dual plane intake and properly set up its a great low and mid and upper mid rpm range intake design that frequently out performs almost all the common single carb intakes in those rpm ranges, its only in the upper rpms that the single planes tend to produce better peak hp,the OFFY is a common plenum, or split common plenum design with almost no decent low or mid rpm throttle response in my experience, but it get good upper rpm and decent but not impressive peak hp numbers. 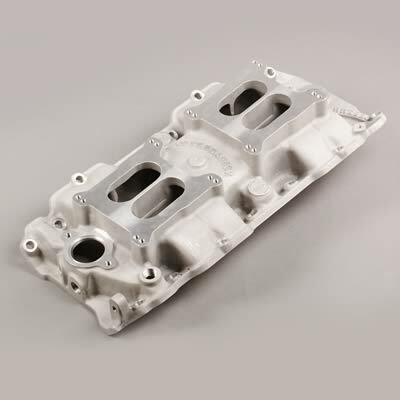 but a TUNNEL RAM dual quad intake will generally produce better upper rpm and peak hp, so it depends mostly on your goal and parts selection, and tuning skill. 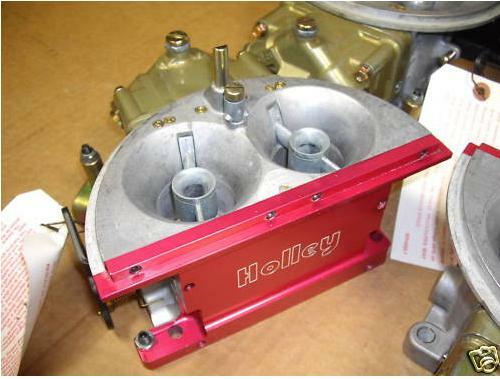 Holley's performance billet distributors are built with premium components to deliver consistent and reliable ignition performance under the most extreme racing conditions. 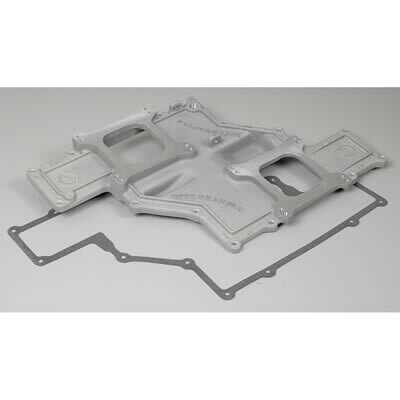 The distributors are capable of performing to whatever rpm levels an engine is designed to achieve. 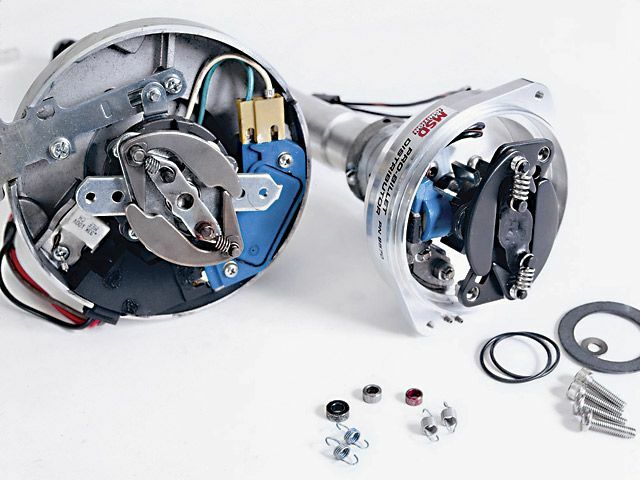 They feature 8 degree vacuum advance and 28 degree mechanical advance settings, with 32 degrees of total advance, a magnetic pick-up, output wires for connecting to the magnetic input of most aftermarket CD ignitions, and caps and rotors that utilize brass inserts for improved electrical conductivity. 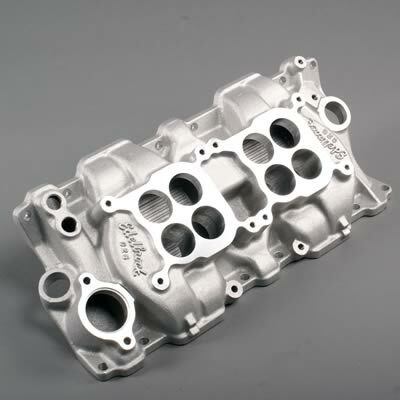 Their stout billet aluminum housings work in conjunction with centerless-ground, case-hardened 0.500 in. shafts for increased durability. 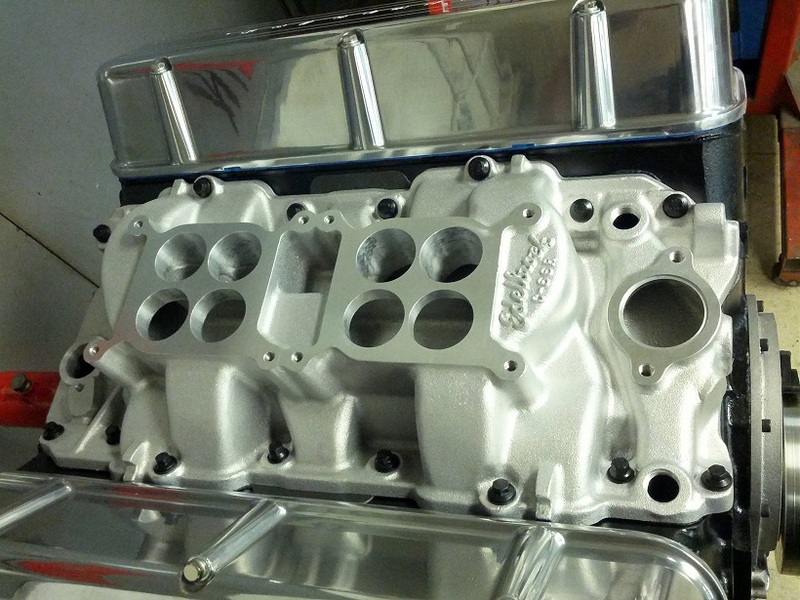 Caged needle bearings at the top and bottom of the housing create longevity and reliable operation up to 12,000 rpm. Very well put, I never really thought about the drop in vacuum with the two carbs, makes alot of sense, I did go round and round with mine but when I finally got a handle on the two 600's the car drives well. 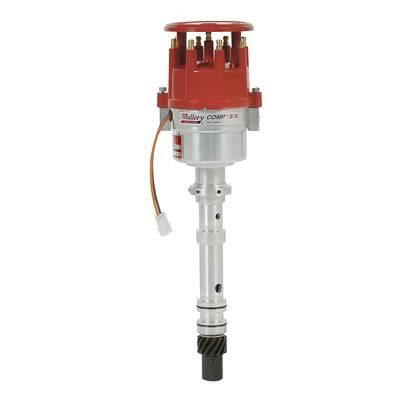 I was surprised that a mechancal pump could handle the fuel load of my 468, but the Holley mech. pump handles the two carbs very well. Again Grumpy thanks for all the info, I will be a readin alot. Really good write up and reference material Grumpy, Thanks!!! 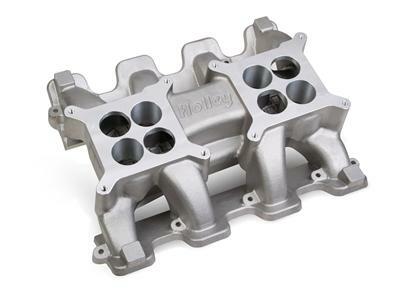 bowtie468, what are the model # of your carbs? Are they vac sec's or mech? 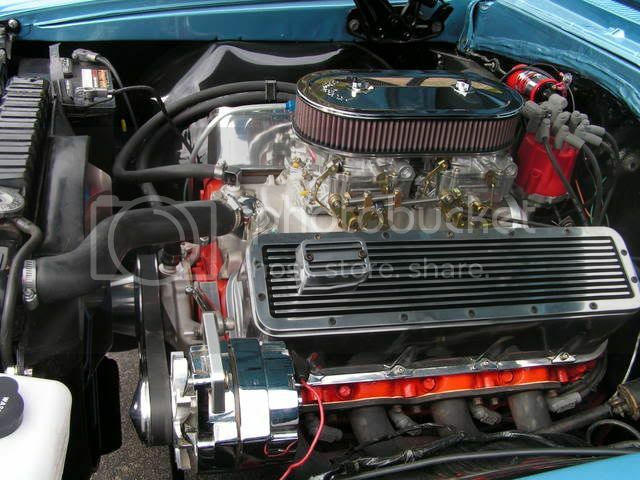 Is that the Edelbrock c-66 style intake? Its unfortunate but accurately tuning dual quads seems to be a rather commonly ignored or lost art, even guys who are good at tuning a single carburetor some how don,t seem to grasp the concept that having two carbs working together in a co-dependent system,is not that same thing as tuning both carbs the same way you would tune a single carburetor. now on a system like a common race engine with a tunnel ram intake where your generally running at wide open throttle most of the time this is far different than in a street dual quad set-up where part throttle operation needs a smooth transition thru all four progressive stages and the rate of air flow varies a great deal during operation, there's a huge difference in a dual quad intake that's expected to transition slowly and in a controlled and predictable manor from idle to wide open throttle compared to a typical tunnel ram where you operate at wide open throttle 90% or more of the time!.. 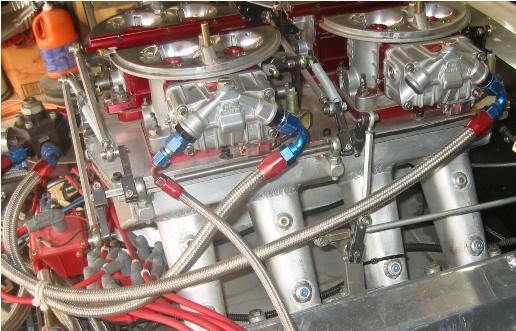 there's sometimes almost as much power, lost or gained in the skill of the guy tuning a dual quad carburetor combo as in the parts used, and Ive seen plenty of very badly tuned dual quad set-ups by guys with little or no clue how to tune a multi carb set-up. 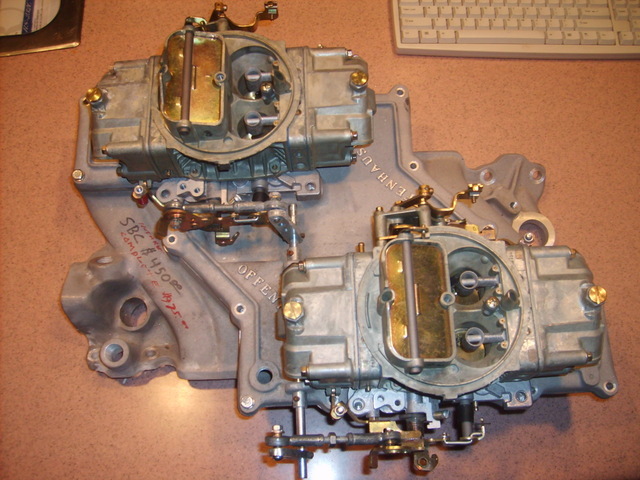 you generally start with both carbs fully closed and adjust the idle air screws out about 1 full turn, the rear carb is the primary so its set up to open about 1/4-1/2 way before the front secondary carbs primaries start too open, differences in leverage arm length and angles and a knowledge of linkage adjustment allows all four sets of venturies to progressively open in fairly uniform stages as the gas petals depressed past the 1/3 third depressed point , when properly adjusted you'll have a very smooth transition from idle to wide open throttle with zero bogs or hesitation, but it takes experience, having the fuel feed consistent and knowing how to set the ignition advance and jets accelerator pump cams etc to get it to respond almost instantly to throttle position changes without dead spots in the transition. 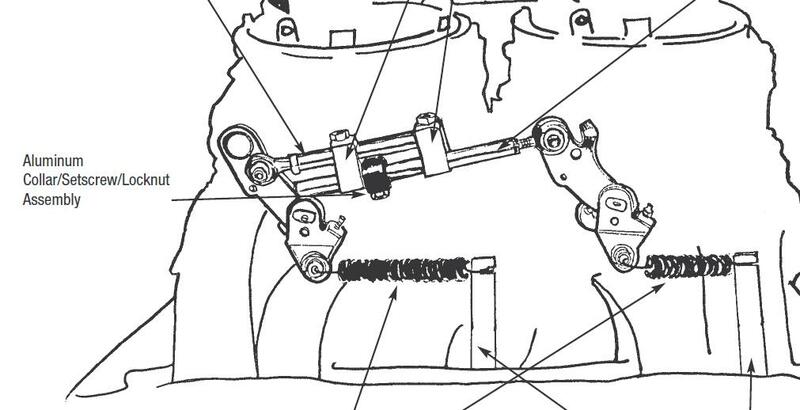 the object, is to progressively open about 1/4 more throttle area as each of the 4 sets of throttle bores open. ok, first of all, a carb rated at 950cfm only flows that cfm at the rated vacuum, installing twin carbs effectively doubles the number of venturies feeding the plenum, so you've effectively reduced the vacuum a great deal. 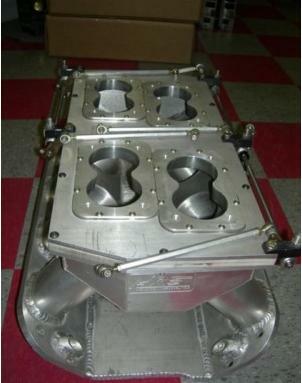 in most cases you want the carb size USED to maintain a MINIMUM 1"-.50" vacuum IN THE PLENUM at WIDE OPEN THROTTLE, on a race car engine, for the street Id certainly try to look for a 1" minimum reading on the vacuum at W.O.T. 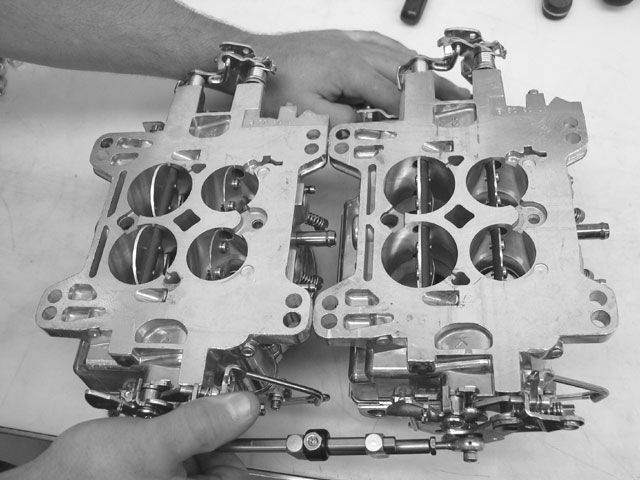 CFM ratings are more accurate than physical carburetor sizes, as the CFM rating takes into account the venturi size of the carburetor. 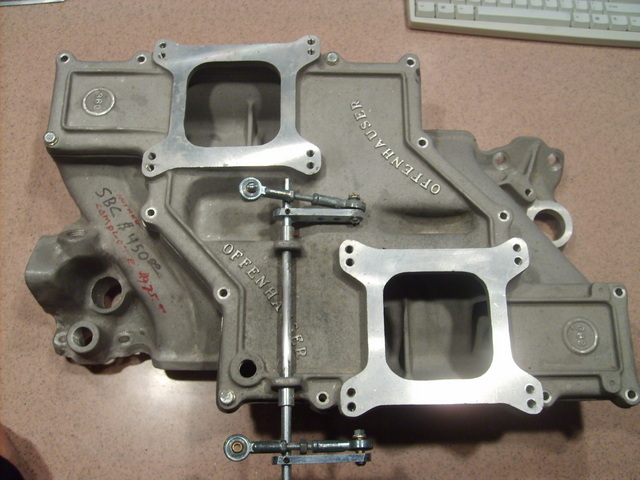 It is not uncommon for a given physical size (see Carburetor sizes paragraphs) to have many different internal venturi sizes. 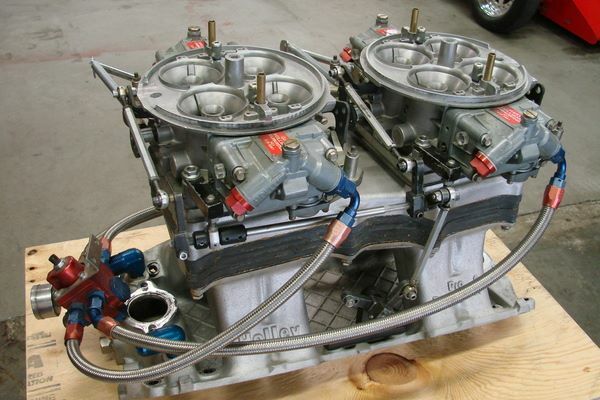 Early Stromberg and Zenith carbs could have as many as 9 different venturi sizes for a given physical size. 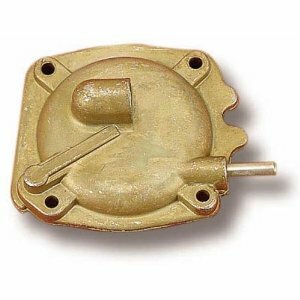 Carburetor CFM ratings have been around since at least the 1920â€™s; however many O.E. (original equipment) carburetors never had published CFM ratings. I have not seen any actual agreement that stated that it had to be this way, but the early published ratings that I have seen for 1-barrel and 2-barrel carburetors were measured at 3 inches of mercury. This rating was about the amount of vacuum available on engines of the period under wide-open throttle conditions. 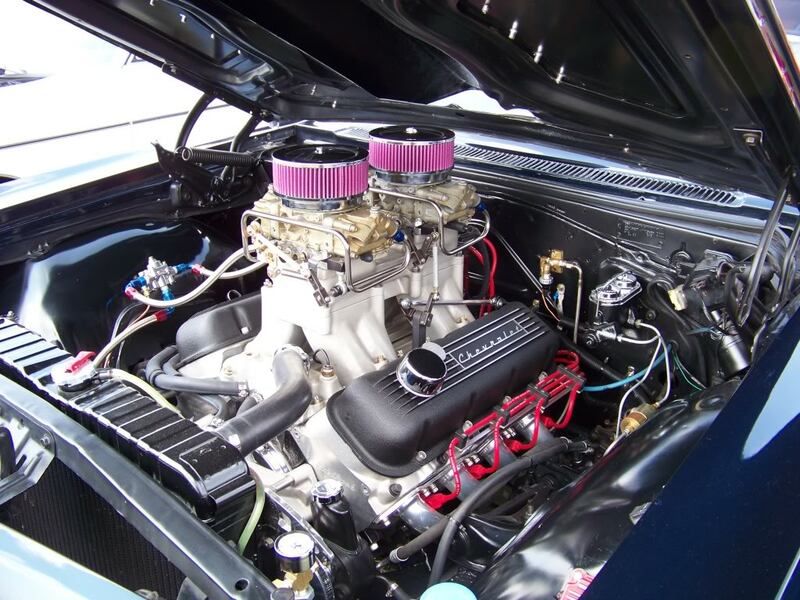 Sometime during the 1950â€™s, engineers found that a passenger engine with a four-barrel carburetor would not maintain a vacuum of 3 inches of mercury at wide-open throttle; and by some convention 1 1/2 inches of mercury was chosen for rating 4-barrel carburetors. The ratings for 1-barrel and 2-barrel carburetors were left unchanged. To convert from one system to another (with a very small percentage of error) is relatively simple. Simply use the square root of 2 (1.414). Thus to convert a two-barrel rating into a four-barrel rating, divide the two-barrel rating by 1.414. To convert the four-barrel rating to a two-barrel rating, multiply the four-barrel rating by 1.414. This worked very well up through the mid-1960â€™s, when carburetor comparison tests became popular in car magazines. 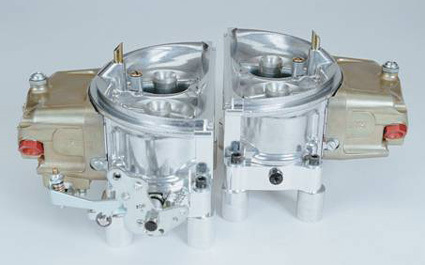 One carburetor company determined that the results could be skewed by rating their carburetors â€œdryâ€ (air only), instead of the conventional â€œwetâ€ (a non-flamable liquid with the density property of gasoline and air mixed). 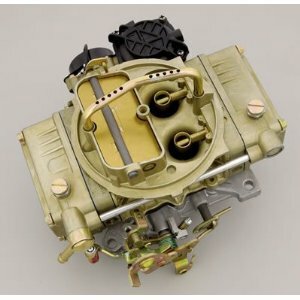 Rating the carburetor dry would add approximately 8 percent to the rating (example â€“ a carburetor rated on the four-barrel rating scale at 500 CFM would now amazingly flow 540 CFM). As the general public was unaware of the â€œwetâ€ versus â€œdryâ€, this system worked fairly well until the mid-1980â€™s when it seems that other scales were â€œneededâ€. No attempt will be made to explain ratings of carburetors produced after 1980. The best way to compare these units would be throttle area (which was a measurement used back in the 1950â€™s and 1960â€™s); or more accurately, the comparitive area of the main venturi. 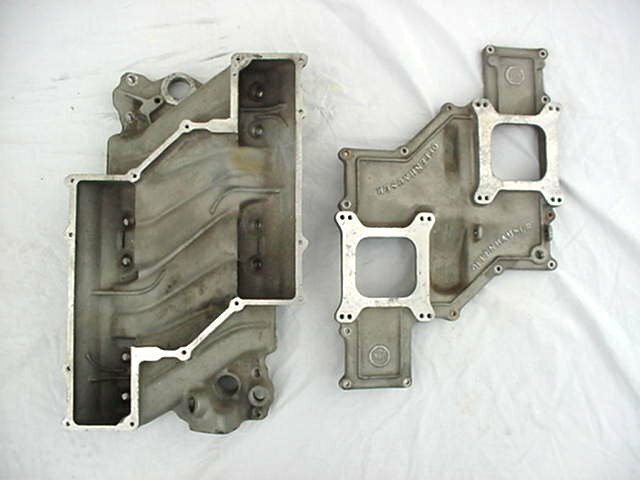 On the later carburetors, best to write to the company, and ask at what vacuum the carburetor was tested, and whether it was tested wet or dry. If this information cannot be obtained, then the rating is suspect. 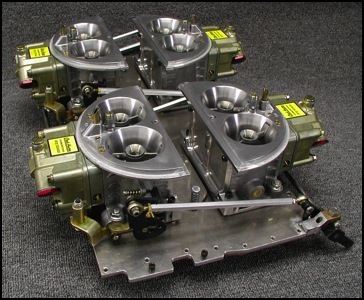 Using a Carter 4-barrel AFB carburetor that is rated wet and rated 500 CFM for an example. To convert this rating to the 4-barrel dry scale, add 8 percent (multiply by 1.08). 500 CFM multiplied by 1.08 is 540 CFM. To convert this rating to the 2-barrel wet scale, multiply the rating by the square root of 2. 500 CFM multiplied by 1.414 is 707 CFM. To convert this rating to the 2-barrel dry scale, first convert to the 2-barrel wet rating as above, then add 8 percent. 707 CFM multiplied by 1.08 is 764 CFM. 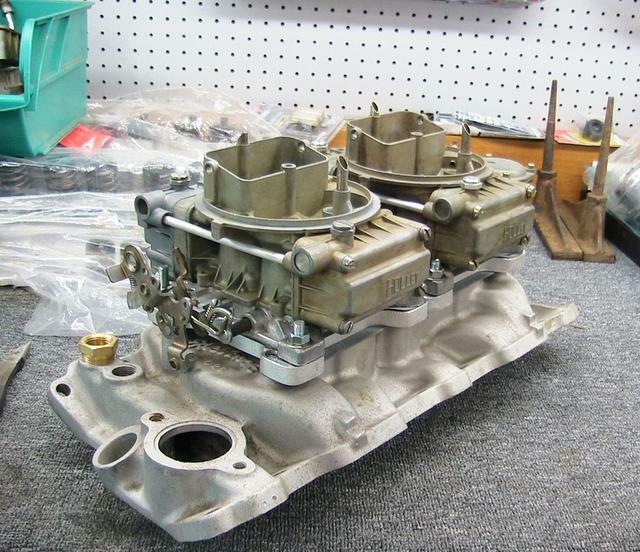 Going the other direction, if we take a Rochester 2-GV carburetor that is rated wet and rated 435 CFM. To convert this rating to the 2-barrel dry scale, add 8 percent. 435 CFM multiplied by 1.08 is 470 CFM. To convert the rating to the 4-barrel dry scale, first convert to the 4-barrel wet rating as above, then add 8 percent. 308 CFM multiplied by 1.08 is 333 CFM. 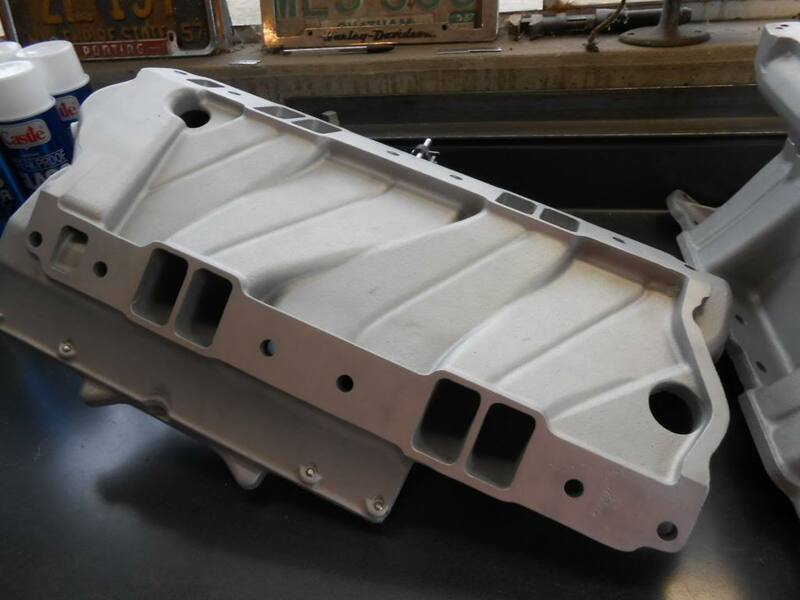 "I had an idea to run a tunnel ram intake on the street and reduce the plenum volume under the carbs a bit to get a quicker throttle response, I have done something similar with several single plane manifolds on the street with good results." 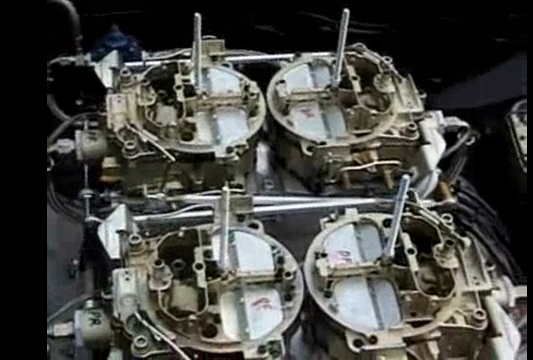 the idea of running individual intake runners to each carb venturie on a tunnel ram intake to reduce plenum area, or to weld in a partition in the plenum and thus increase the rapid response to throttle changes comes up fairly often,but it won,t work unless all the carburetor venturies , both flow equal quantities of fuel/air mix all the time at the same fuel/air ratio, and all the throttle blades open at exactly the same rate. 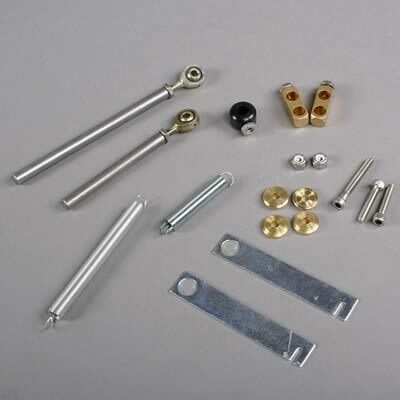 which is only something a few carbs are capable of doing and most of those are Holley dominator based designs designed for that application. 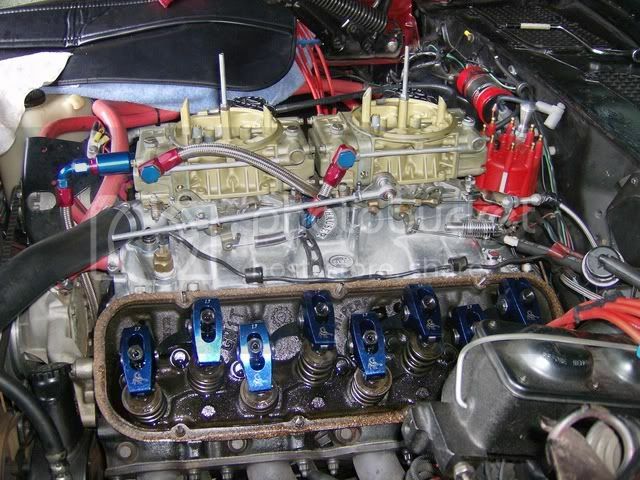 Id also point out that the plenum under the carbs allows a great deal of flow sharing that allows you to feed a single intake runners from more than a single carb venturie, thats critical, because in almost all cases a single four barrel carbs single venturie is too small in diameter to effectively supply the needs of an engines cylinders. If you do the research youll quickly find out about port stall speeds, and effective port cross sectional areas. This represents the highest speed of the air in the flow path, at or near the section of minimum area (i.e. through the valve seat at low values of L/D, through the pushrod pinch, or minimum intake cross section, which ever is smaller). This should be the highest velocity measured in a port flow tested at 28â€ of water column. We want to find the average speed of a piston traveling up or down between TDC and BDC. Though it should be emphasized the piston speed peaks much faster than the value we will find, and it slows to a stop and perhaps reverses slightly at TDC & BDC, this mean (average) velocity figure is highly useful as a comparator. 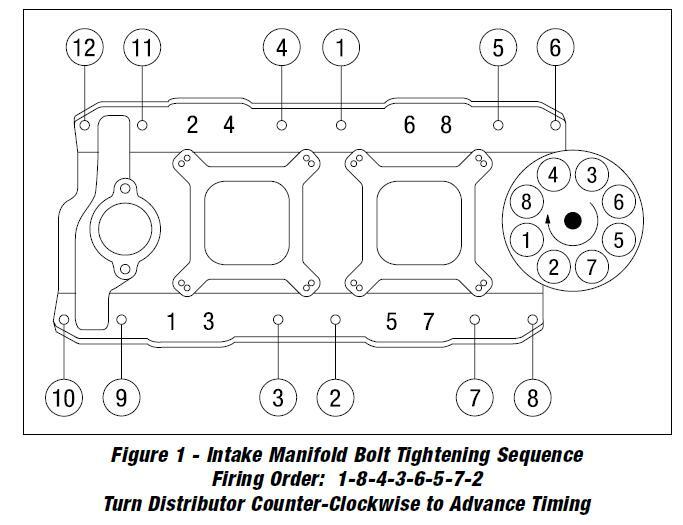 It's also useful to note for later that because of the secondary-linkage effect of the connecting rod, the piston spends more time in the lower 180* of the rotation. We want to find the average gas velocity over a stroke of the piston- a half revolution of the crank, assuming we have the cross-sectional area of a header tube, or of an intake or exhaust port. The latter can be approximated by measuring centerline length and port volume, and subsequently converting the units of measure to match the units for the motor bore area, in this case, square inches. 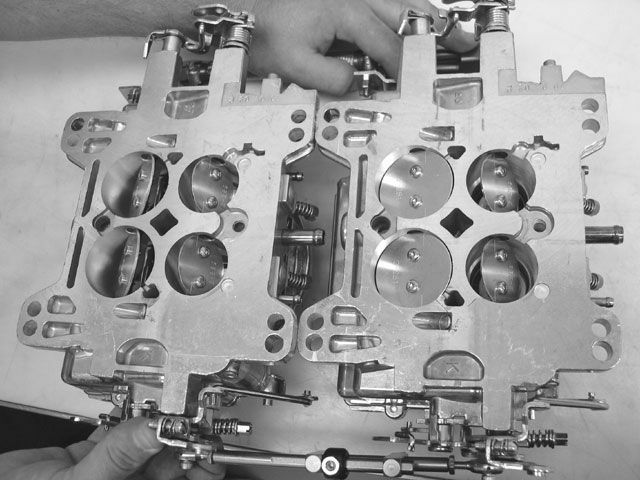 There are several ways of accumulating the measurements required, but the simplest starts with bore area which we are likely able to calculate easily, either working from bore diameter (â€˜Bâ€™) taken down to radius, & squared & multiplied by Pi, or from engine total volume divided by stroke and number of cylinders. So we now have an existing area relationship mathematically described. To use some examples, if the piston had 6 inches area and the header pipe 2, we would have a factor of 3... and a design error on our hands: practice has proven that the relationship on the exhaust side should be between approximately 4.5, for high RPM 4-stroke modern motorcycle engines and dedicated auto racing power plants, to as little as 9 for those of us working with older low-RPM-oriented production power plants, and between 4 and 8 on the intake side. This relationship is far better described/defined by what we are working toward a calculation of: gas velocity at RPM. We can calculate that by combining the two formulas. When we had bore area calculated above and looked at its relationship to port area, we could envision the gas achieving some unknown- but already apparent to be high- velocity as it exited through the port, or arrived through the port. What we didn't include was quantification of the volume being transferred each cycle: how deep the piston traveled to reach BDC, or how many times per second did it come back to TDC? We spoke of an imaginary engine having pistons of 6 sqin and an exhaust header pipe of 2 sqin (you could also evaluate the intake side by using intake runner size). That's a pretty small bore diameter- 2.75" or 70mm - more motorcycle range than automotive, so lets say it's a 1000cc (61ci) four cylinder sport bike. The stroke is then calcuable to be 2.54", and we are doing calculations like this with power in mind, so letâ€™s say that the RPM we wish to examine is 10,000rpm. The port area used was 2- we referred to the header pipe area, but that's an extension of the port; we'll start ignoring the difference. and, as noted, that is too low a figure. In practice rules of thumb have developed saying that at peak power, the ft/sec figure should be somewhere within 280-380 exh and 240-355 intake. Letâ€™s take another example- a 350 cid v8 with a 1.5 OD diameter header pipe and a relatively mild state of tune that leaves us interested in its 5,000 rpm statistics. It has a 4.000" bore (area=12.57 in2) and 3.48" stroke, and the ID of the header pipe is approx 1.39" (1.52 in2) as in a typical 1.5" OD pipe with wall thickness deducted for accurate calculation. 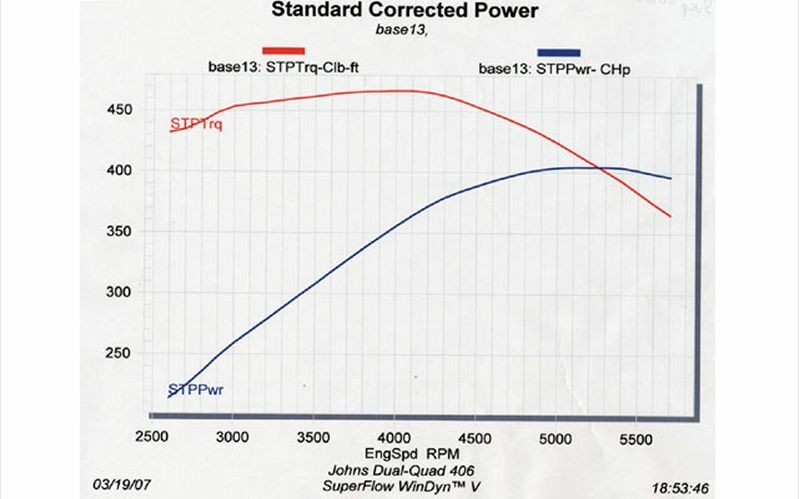 This result implies the motor is being revved slightly beyond its power peak and/or that larger headers would likely give more power at this and any higher rpms. As always, a trade-off exists, as the 1.5" pipes will have produced a greater power up close to this rpm, and may make it unwise to take that power advantage which has "accumulated" as the motor rpm's have risen under load, and trade it off for greater peak power. The next available tubing size up - 1 5/8th's- is an 18-19% jump, putting the ft/sec figure @ 325, which is actually perfect for 5000, but progressively tending to be wrong as you look at increments of lower RPM. The first header intend is for a motor with 3.64" bore, 3.5" stroke, being shifted at 4900rpm but with the emphasis on low end and midrange, so calculate using the rpm figure given, but emphasize the low and mid range by using higher ft/sec figure than I would otherwise. So where does that leave us in picking a tube size? That figure is in square inches, so we divide by Pi, take the square root, multiply by two, & arrive at a dimension for ID. I add .049" x 2 for the walls to get the OD, and find it to be 1.42". We already figured I'd use 1.375" OD for several inches coming off the ports and do the remainder in 1.5". Now weâ€™re less worried that the 1.5 need to be mandrel-bent, though we know the disadvantage of 'crush bent' is less related to simple loss-of-area type restriction and more the energy used in speeding up and slowing down the gases as they pass through cross section changes. Since this area of pipe figure is notably smaller than the stock port area as measured at the opening (~1.8 in2), it confirms I am on the right track in filling the port floor. Since it's becoming apparent that the variable we are most likely to want to solve for is the port area, we need to reformat our equation to solve for port cross-sectional area when we have all the other figures. This requires setting the formula up with an adjustable ft/sec position, because depending on the character of the motor's use you will have different aims. Putting the formula to yet another use, you can measure the ports you have to see what RPM band they suit. Take soft wire, like solder, and measure the top length (beside guide) and bottom length, averaging them to get centerline length, then CC the port. You can now calculate average port cross section: take the CC's and divide out the length. Remember 16.39cc=1ci, convert the port volume into cubic inches before dividing by the length, assuming you used inches to measure centerline length. So, some rules of thumb as far as desired gas velocities. 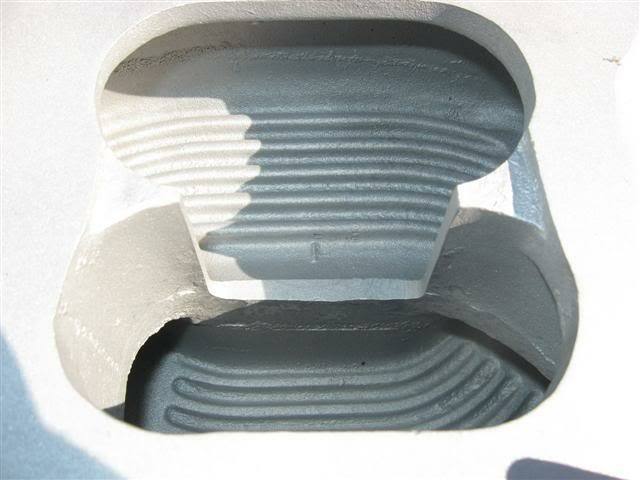 Highly developed ports such as those found in race specific castings can accept 10-20% higher velocities, due to the lack of flow differentials. In other words, they use the full port area, and to not have "hot spots": areas where the flow chooses to concentrate and which could become turbulent or supersonic if pushed beyond a certain speed. Also such engines are likely to have high compression which somewhat changes the dynamics of cylinder filling and emptying. Figures shown are average velocity throughout the port, and references to effects are in the RPM range of peak horsepower. 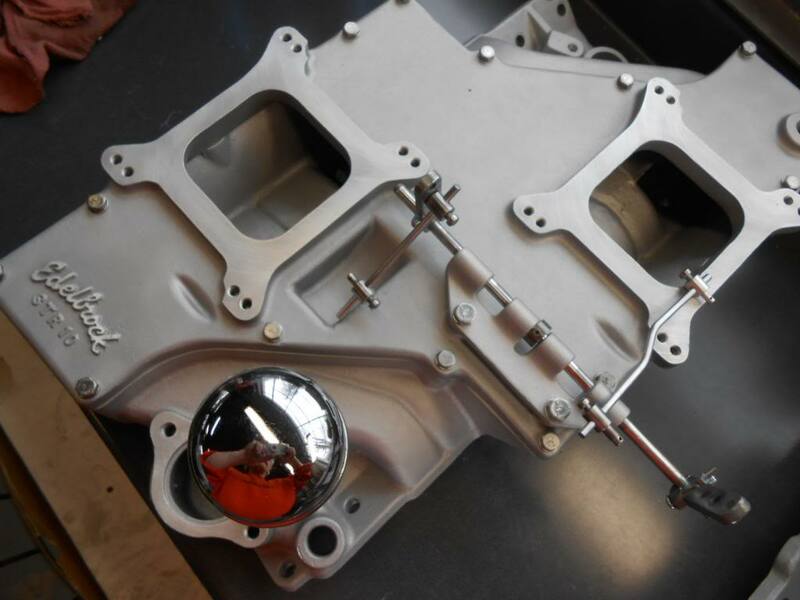 Q: We have just got a sbc built and the engine builder had a blonde moment and has installed a sheet metal intake with way to large of runners on it. Needless to say the motor does not make the power we are looking for. My question would be if we are able to install a sort of insert and get the runner volume under control will we see a good gain in power even though the plenum volume is still large. It is a 366 SBC with Brodix canted valve heads 290cc 13.5 :1 comp. The total runner length is 12.4 "and needs to run at 6000 to 6500 steady WOT rpm. The runner volume right now is 600 cc and I figure that it should be about 300 cc. 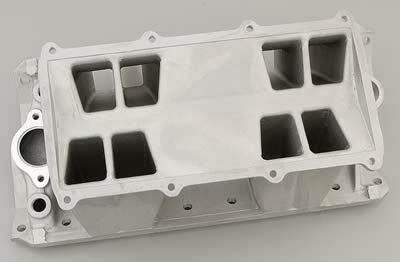 A: With a 12.4" long intake tract (port and runner total length) you are tuned from 6800 to 8000rpm. This is well above your engines intended operational rpm range. This means your operating the engine at an RPM where the intake tract pressure pulse is either neutral or slightly negative. You may be neutral in this area so reversion might not to bad but itâ€™s far from an optimum situation, now for the good news. Depending on the manifold design you have, you can either increase air speed to band-aid the runner length or make spacers to put in the plenum to lengthen the runners. You really need .750 thousands to bring the manifold back into tune but that will take up a lot of plenum volume. If youâ€™re out of tune the runner volume is secondary to air speed and wave tuning. I have done this many times and actually do it quite often. In many cases the results are astounding. Our 622 engine uses the Profiler 2/4 tunnel ram intake. 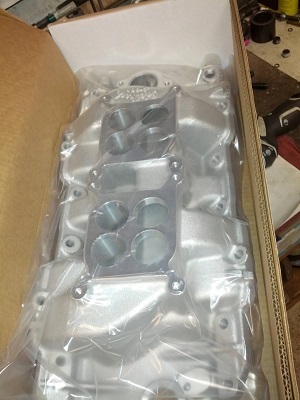 This manifold is tuned from 7400rpm to 8700rpm. 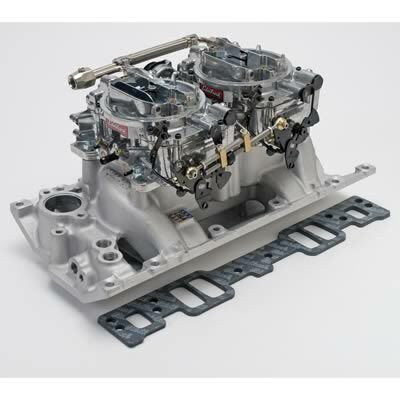 The larger engines all operate from 6000rpm to 7500rpm and some as high as 8000rpm. So the engine is trying to make peak TQ at 5500rpm and peak power at 7500rpm. Using this manifold causes a hole in the mid range of the power curve because itâ€™s "out of tune" there. I fill the runners to increase air speed as much as possible without hurting top end power. 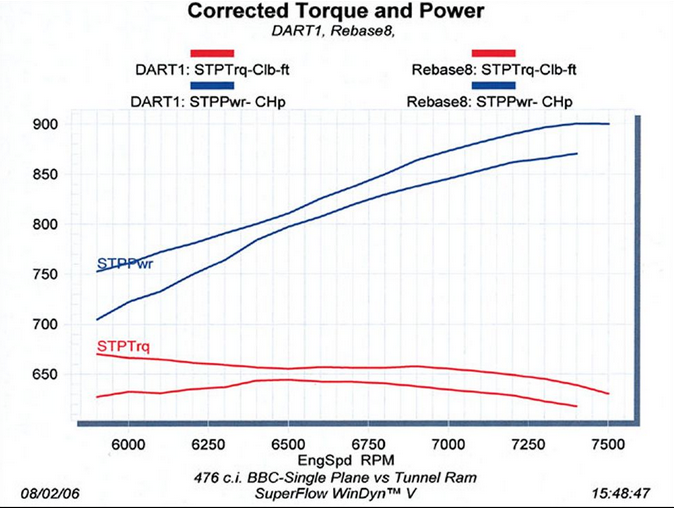 The result is a 45ft/lbs increase in torque and a 60hp increase in power through the middle of the power curve. The engine accelerates much faster and recovers on the gear change better. 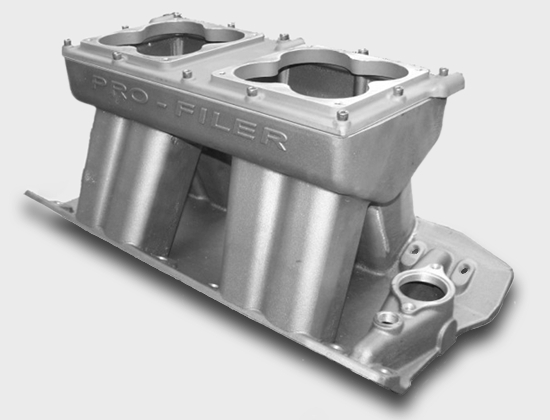 If I where able to put plates in the plenum to increase runner length instead of increasing air speed the result would be even more power and a broader power curve because I would not only have the proper runner volume but the proper tuned length as well. 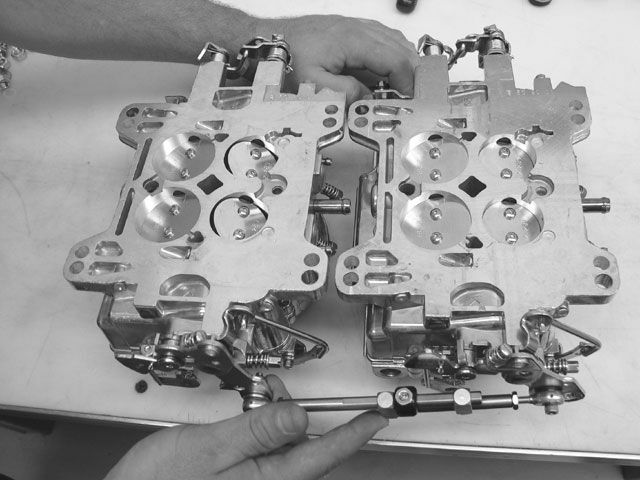 The course of action we take as well as the end result will depend on the manifold design you have to work with. Sometimes I can band-aid them and sometimes I canâ€™t. 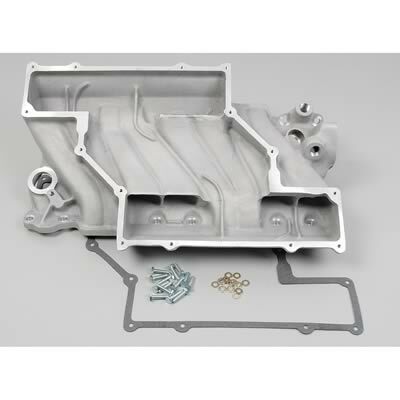 If you have measurements and pictures of the manifold it would help a great deal. I can talk you through it if you want. The Cross Ram was never intended, nor was it developed (tuned) to be used with the Smog Equipment. The only reason it appeared in the Car Life article (and others) was to satisfy the Corporate mandate to pre-empt any negative connotations derived from the article that might imply Chevrolet was not in sync, or worse yet, ran counter to the Government mandated SMOG laws. It was a risk that Chevrolet could not afford to take for political reasons. 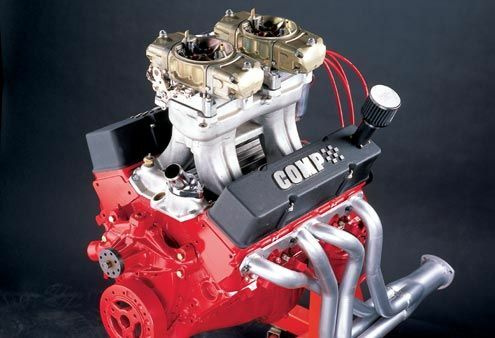 The true intent by Chevrolet was to have the tuner build the Cross Ram equipped 302 in the "recommended" tuned state it was developed for using Chevrolets Tubular Headers with specific timing and tuning considerations - never with the Smog Pump since it was counter indicated for performance which was implied and understood by all race tuners and street racers back in the day. 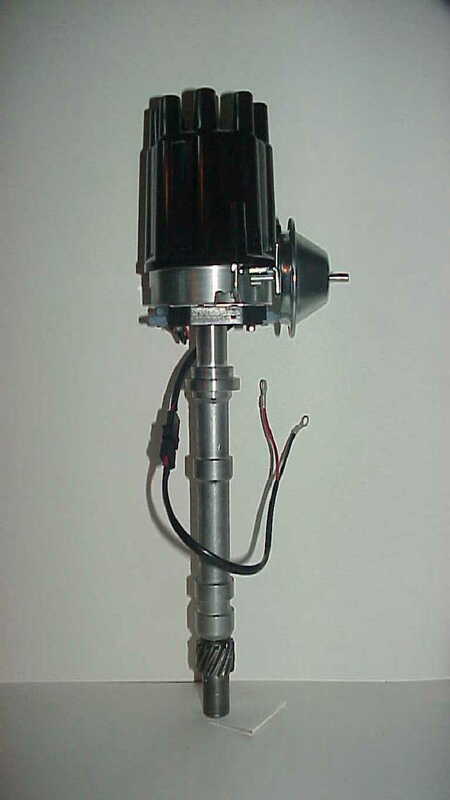 The SMOG Pump is actually a centrifugal AIR pump that forces compressed air into the exhaust manifolds to decrease the hydrocarbons by DILUTION. A totally ineffective smog reducer and supreme power waster that adds extra weight. In fact, you could make the argument that it actually increases pollution due to its inefficiency. No one was fooled by it back in the day. Bottom Line - The only reason the 302 appeared in some publications with the Smog Equipment was to appease Corporate Management and placate the Government. 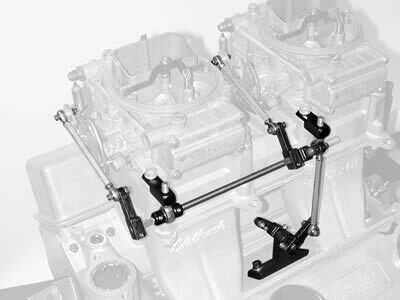 Understanding that, if you go with-out the pump as intended, you will benefit from maximum power which is consistent with Chevrolets true intent for the Cross Ram and from a pure nostalgic point of view be in sync with what everyone actually did back in the day. That is the true spirit of the Cross Ram equipped 302. 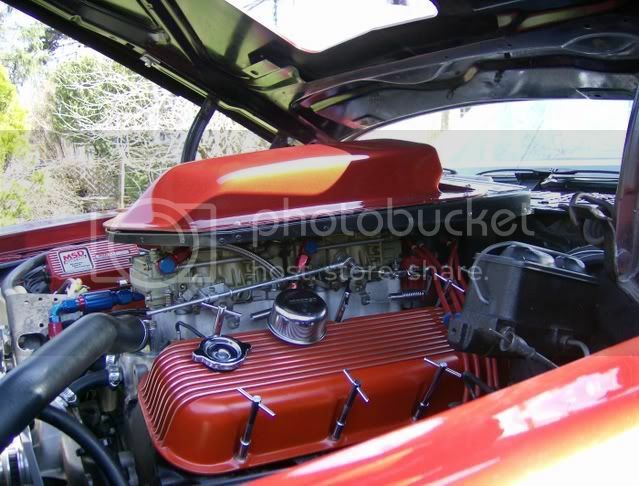 I'M always amazed at guys who overlook checking the simple stuff, frank stopped by with a friend who has a 1967 fair-lane with a 428 ford engine with dual quads that looks fairly close to this picture I found on the internet, except his cars a burgundy color. they had spent a couple hours installing the intake manifold and swapping jets on two 470cfm rated Holley carbs they had installed om a swap meet dual quad intake, it was barely running so knowing I'm a big fan of dual quads they decided to come by. 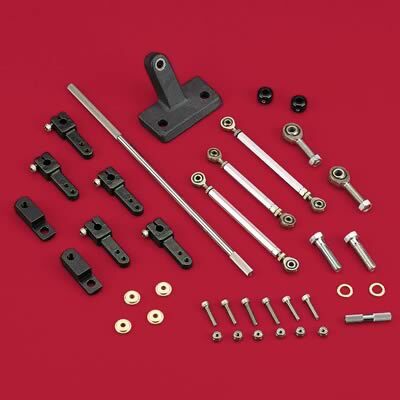 the first obvious issue was the linkage was set up incorrectly and the linkage contacted the air cleaner assembly restricting the movement of the linkage . well the first thing I suggested was getting the linkage binding issue resolved and then verifying the ignition timing and fuel pressure, once I checked those it was easily apparent that the float levels were not set correctly.once that was corrected I started checking the linkage which they had set up so both carbs opened exactly at the same time and rate rather than progressively. checking that and adjusting the linkage resulted in finding the both the front and rear carbs throttle bores intake gasket was binding the throttle blades , so a trip to the local napa store to get new carb to intake gaskets the gaskets came off and got replaced as they were not correct. once that was fixed its was time to make a test run and it was obvious the jetting was a bit too lean, naturally NAPA didn,t have a large selection of holley jets, so I had to send them out to get several sets, after an hours wait we swapped jets up two sizes and the engine seemed to pick up 50-70 hp and the car idled far smoother, but after a few minutes I found the power brake booster vacuum line leaked, once that was replaced the car ran much better. 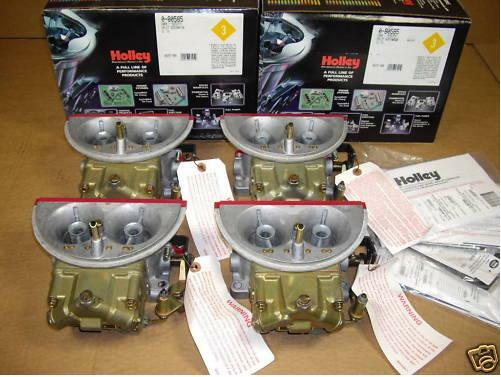 Holley now has available a mid rise dual quad intake for the LS series of engines, , it was tested on a 5.3 LS engine that had a stroker 4" crank and trickflow 215cc genx heads installed. 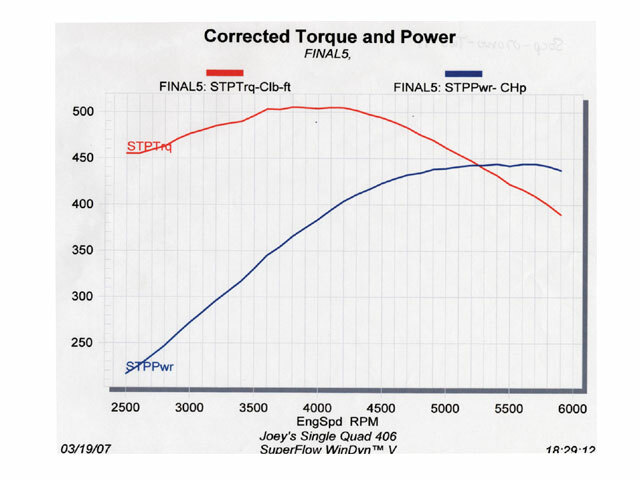 but much of the lower rpm torque curve was no contest, the dual quad dual plane intake produced more than 50 extra ft lbs of torque at 3200rpm, making the power curve much more street friendly , and knowing how POORLY most of those magazine guys can tune dual quads and knowing that the intake was not ported before it was installed theres ZERO doubt in my mind that a properly ported and tuned dual quad intake with a cam designed to match the application could significantly improve on those power numbers, especially with two 500-600cfm carbs installed vs the twin 390cfm carbs used,keep in mind EFI cams generally have a wide 112-116 LSA and carburetors generally work better with a tighter 106-110 LSA , as it increases the cylinder scavenging efficiency a bit, and increases the working dynamic compression, but makes efi sensors read flawed data. 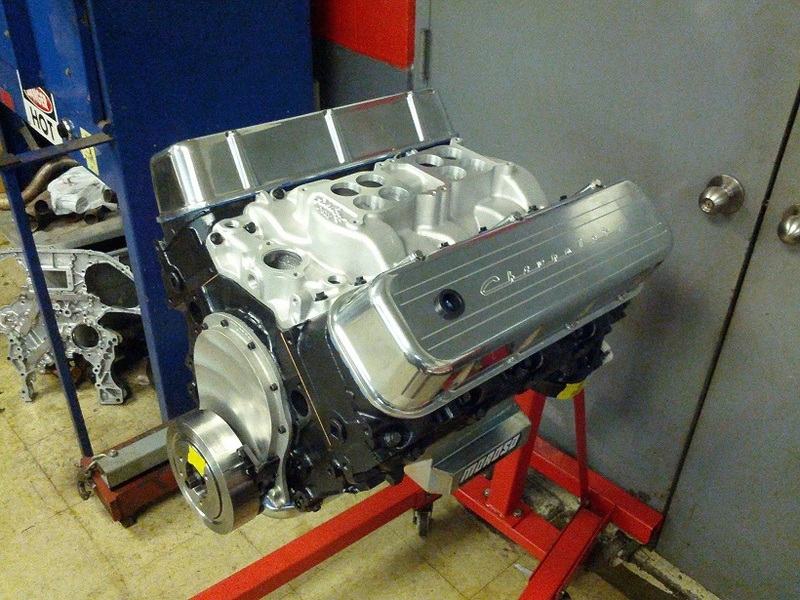 and a couple 390cfm carbs are a bit small for a 383 running up to 6200rpm on a dual quad intake. 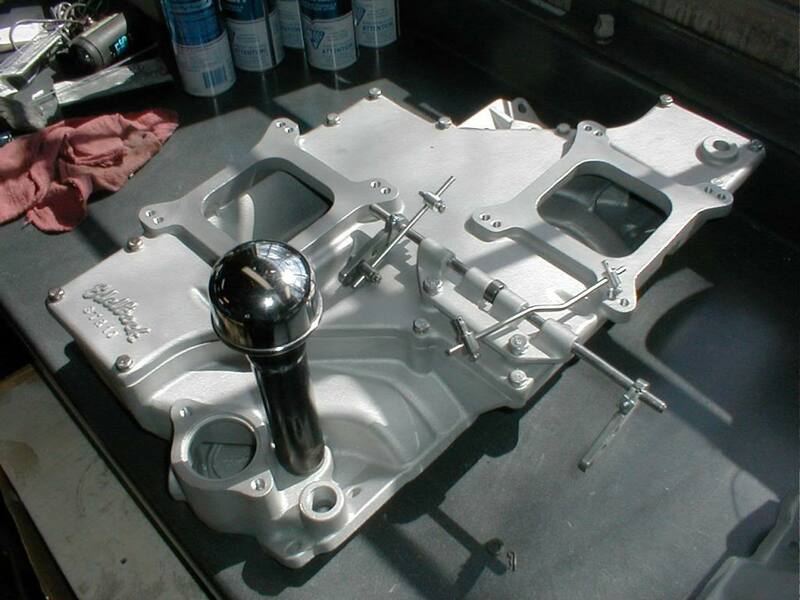 Id also point out that no carb spacers or extensive tuning was done to find or maximize the true power potential. Thanks for taking time to write up in the past. Was researching on my own & found what I was looking for. Big B was a Dual Quad guy like you. He did amazing stuff on the street with them Tuned. 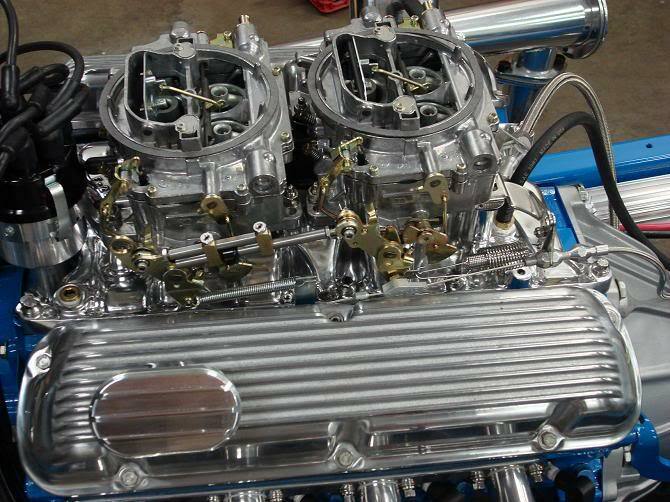 Who wouldn't be happy with a street engine that pumps out an honest 1 hp per cubic inch, especially when the motor displaces 406ci? 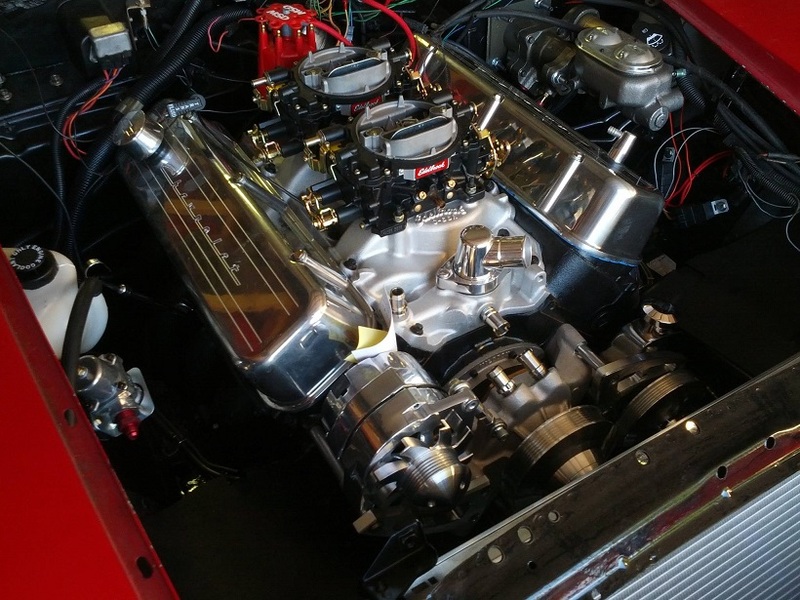 Equipped with a set of Pro Comp aluminum heads, a healthy hydraulic roller cam, and the new Edelbrock Performer RPM Air Gap Dual-Quad intake (with 500-cfm carbs), the 406 produced 406 hp and 470 lb-ft of torque. 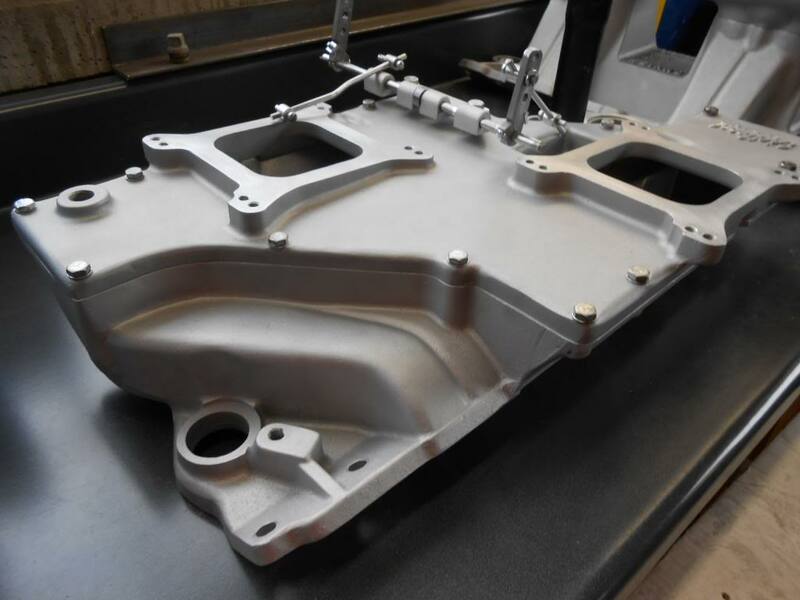 Torque production from the big-inch small-block exceeded 450 lb-ft from 2900 rpm to 4600 rpm. Add to this power production the cool factor that comes only with multiple carburetion and you have an impressive rat rod powerplant. This combination clearly demonstrates why dual-plane intakes combined with a single four-barrel carb rule the streets. 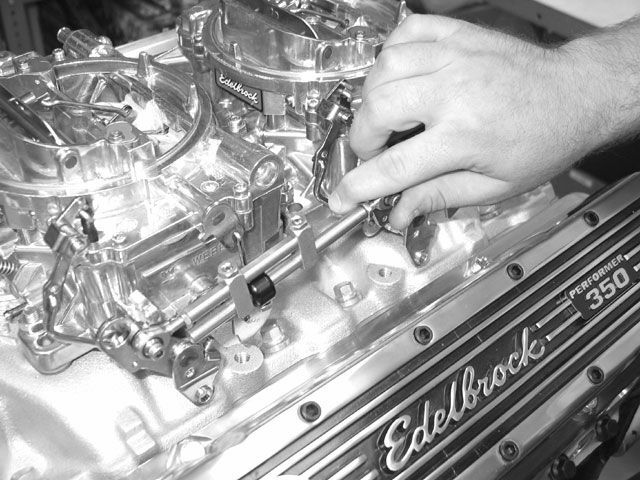 Equipped with the Edelbrock Performer RPM Air Gap and 750-cfm carb, this 406 produced 444 hp and 505 lb-ft of torque. In all honesty, it is tough to beat the Air Gap for average power production. This combo netted torque reading that exceeded 450 lb-ft from 2500 rpm to 5300 rpm. The results of our comparison show the single four-barrel to be the hot setup, however, as the old advertising escape clause goes, "individual results may vary." 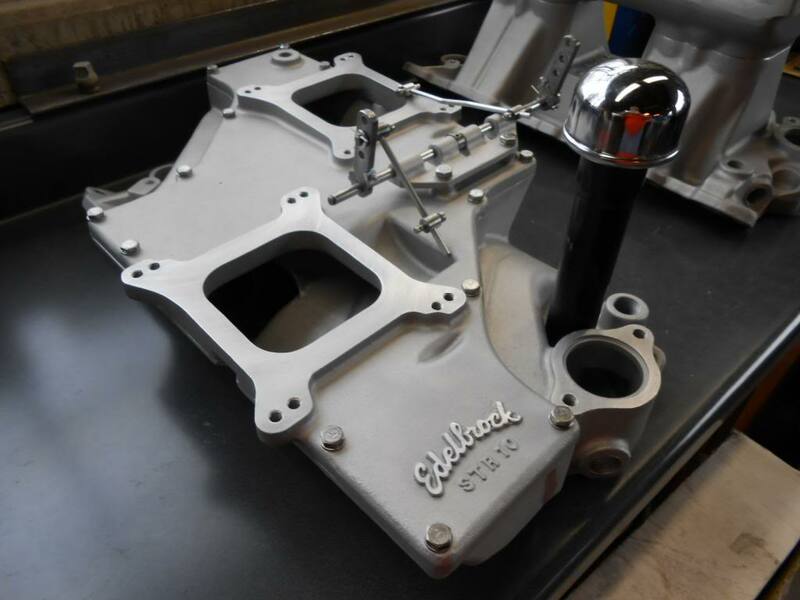 An Edelbrock spokesman says its testing has shown the two systems used here to be very similar in power output, and that he was surprised by the 39hp deficit we witnessed for the dual quad. In hindsight, maybe we should have swapped induction systems to see if there were any variances in the two 406s. Still, given our compression ratio, cam, and redline, our trusty old carb-picking formula says 750-cfm should be just about ideal for this engine. 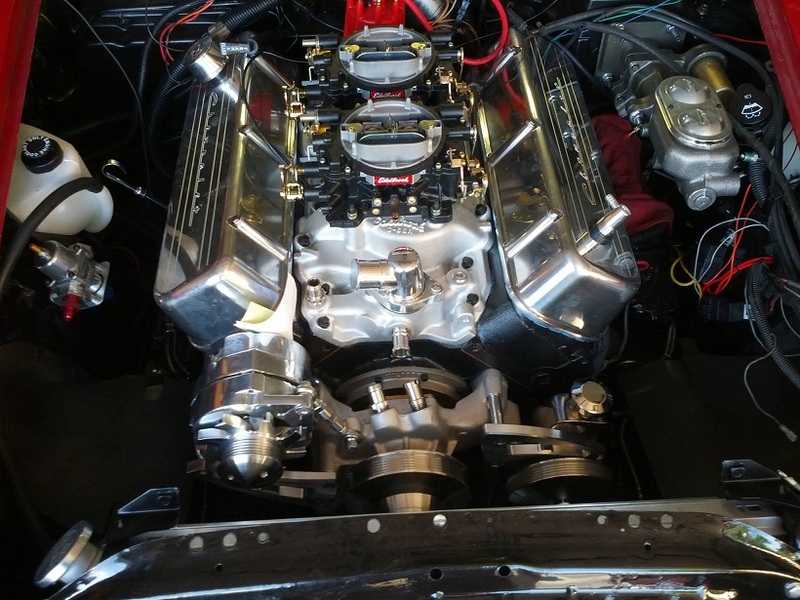 As antiquated as it may be, we love a good tunnel-ram and dual quads atop a muscle car V8. As a result, we've probably tested more of them than most guys have, so we rarely fail to disagree when we see stuff like this on forums: “Tunnel-rams are great for racing, but that is all. I laugh when I see people with tunnel-rams on the street, because they are so impractical. Those intakes have absolutely no bottom end, and they don’t come alive until 4,000 rpm.” That’s a direct quote that we haven’t attributed because it sums up all the commonly held beliefs. We have half a dozen tests on small- and big-block Chevys and Mopars that show tunnel-rams with significantly more torque production—even at the lower end of the scale—than with a dual-plane intake. 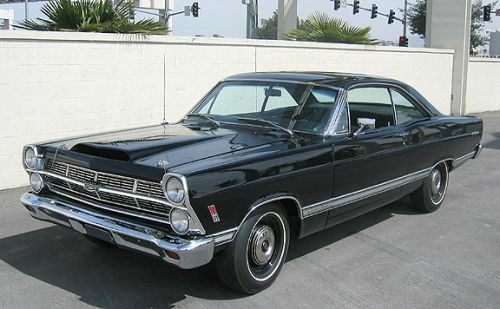 In some cases, the rams didn't improve peak torque figures, but they always made better top-end power. 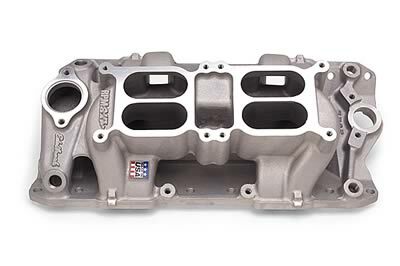 That said, it tends to be the camshaft that dictates the rpm at peak power, and intake manifolds only wiggle that by a couple hundred rpm at the most. 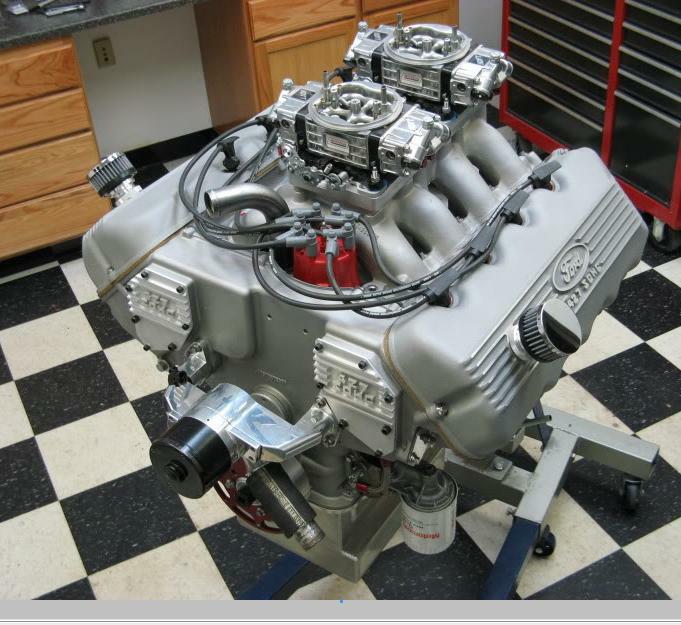 An engine that makes peak horsepower at 6,200 rpm with a high-rise dual-plane will probably make peak power at 6,200–6,400 with a tunnel-ram; if the peak-power rpm jumps more than that, then the engine was seriously strangled by induction to begin with. The rpm at peak torque may rise, but typically, the torque at the old rpm point will still be higher than it was. This isn't to say that any tunnel-ram is great on the street. The race-style, low-rise tunnel-rams do tend to sacrifice low-end torque; it’s the high-rise units like the Edelbrock TR1Y (shown) and the Weiand Hi-Ram series that are street-oriented with longer runners. Long runners make torque; short runners make high-end power. The other problem with tunnel-rams on the street is that cold starts can be a hassle. Guys claim that tunnel-rams bog, but that’s only when the carbs are too large or not tuned properly. A tall ram and dual quads on a midrange street mill can make for incredibly snappy power. The only problem with a Tunnel Ram on the Street is that that Cops 5 'O Take notice. Especially when its as tall as the roofline of the car. Heavy Rain Downpours spoil your fun too. Ultra Rare Mickey Thompson Tunnel Ram Dual Quad the best ever made for a Pontiac V8. Know a guy that owns 2 in Illinois. I will have to watch the U-Tube videos today while turning wrenches. Hydraulic press out style. Not fun. Remove steering knuckle. 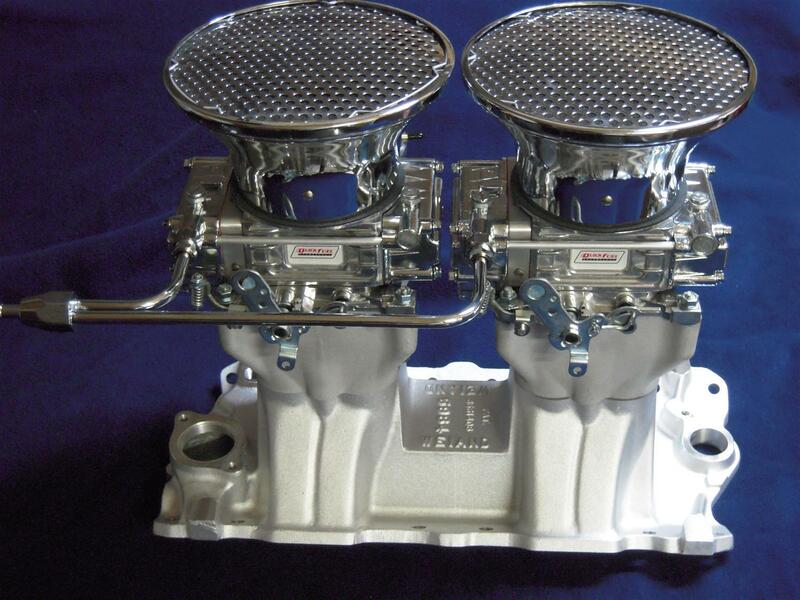 I spotted Split Dominator Race Carbs. Not run of the mill. $10k Pro Stock Material . Win the Race at all costs. Also spotted your old Pontiac V8 Mickey Thompson Crossram. 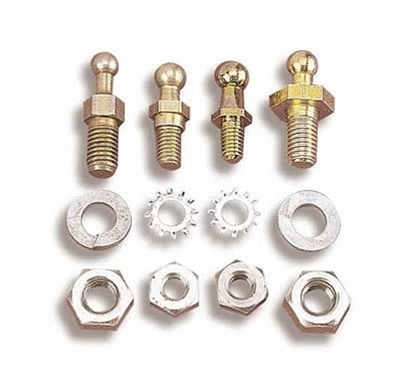 1959-64 Head to intake Bolt pattern. You know some NHRA SUPER STOCK TRICKS TOO. 455 1ST Invented by Rodders & Racers. 4.300 welded & offset ground early 389 Forged Cranks.